It’s weirdly hot here in the northeast. Like so hot, that when we spent this weekend at the shore, my husband and I actually went swimming in the ocean. At the end of September. Weird. Well, I still had to make it feel like fall. So to get my fall fix fast, I made these easy pumpkin donuts. And really they are easy. The donuts only need 4 ingredients. And the glaze is another 3. NBD at all. You guys know I’m all about the semi homemade baking hacks, right? I love to take a box mix and make it more interesting like this Shortcut Bailey’s Cake with Bailey’s Chocolate Frosting or my Shortcut Boozy Kahlua brownies. 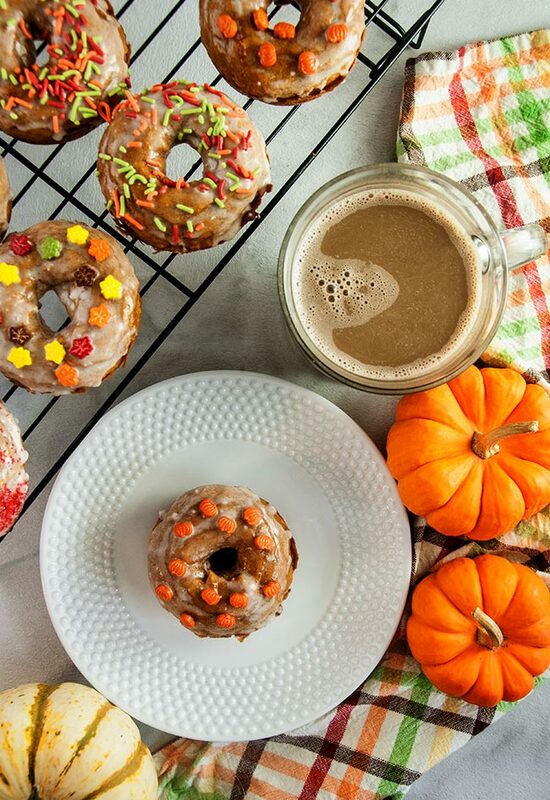 That’s pretty much what the deal is with these easy pumpkin donuts. I got the idea from a friend of mine. This friend helped kick off my pumpkin obsession. Because she has one too, and a love for all things Christmas. Many years ago back before Pinterest was a thing and a gateway to all things pumpkin, I was hanging out at her house when her kids were little, and she made two ingredient pumpkin gingerbread muffins with a can of pumpkin and a box of cake mix. Guilt free, she said, because there was no butter or oil but so good and dare I say- moist- because of the pumpkin. Well, these donuts kind of take that concept of those muffins and put it in donut form. Except to keep it truly basic (no shame in my game), I used spice cake mix instead of gingerbread cake mix so you end up with perfectly pumpkin spiced donuts. I started off thinking I could use only two ingredients, the cake mix and the pumpkin, but the resulting donut was too cakey and thick. So this needs a couple more ingredients: milk and eggs. The result? 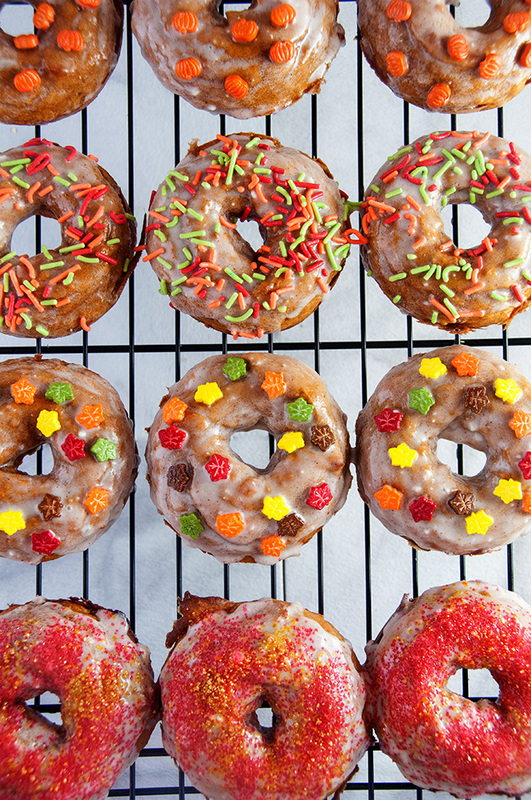 Unbelievably light cake pumpkin donuts full of so much fall flavor. And the glaze? So easy. It’s powdered sugar, butter, and pumpkin spice coffee creamer. Because you can never have too much pumpkin spice. 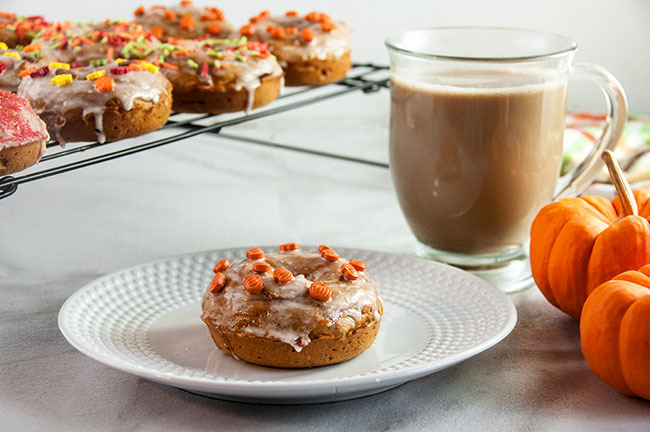 Easy Pumpkin Donuts are sure to please every pumpkin lover this fall! Preheat the oven to 425. While the oven is preheating, stir together all the ingredients for the donuts until the batter is well combined. Spray a donut pan with non stick spray and spoon or pipe batter into the donut cavities. Bake for 10-12 minutes. Let cool and remove from donut pan. While donuts are cooling, combine all the ingredients for the icing, starting with 3 tbs of coffee creamer. Whisk together until the icing is smooth. If desired, add another tablespoon of creamer to thin the icing out to a more glaze like consistency. Dip the donuts into the icing and sprinkle with sprinkles if desired. Let icing set for about half an hour. Enjoy! 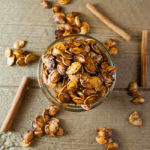 OMG these sound amazing! I love pumpkin muffins, pumpkin pie, etc. 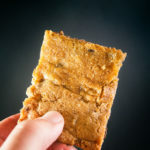 so these sound like a great addition to my fall baking must-haves. Thanks for sharing! 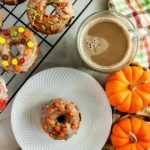 Ooh I have been wanting to make pumpkin donuts this fall! 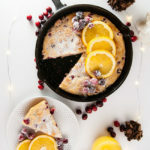 Now I have a great recipe to try! Hahahaha! So did my daughter. She ate all the sprinkles off several donuts. These donuts are so cute! And i love how easy they are to make! Oh I hope you do! My daughter loved them and is asking me to make more. 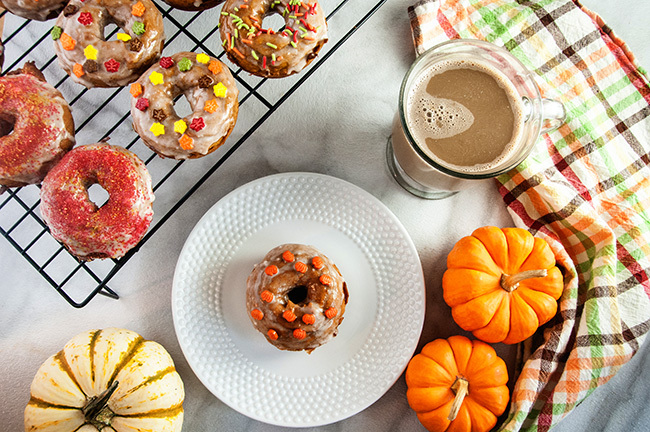 Ohhh Pumpkin Donuts – so delicious! 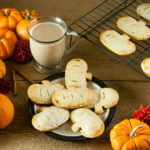 I love your cute Fall decorations and I am a huge fan of using flavored coffee creamer in recipes! These look great and the calories/fat are both low in comparison to fried donuts. Every time I bake donuts, they come out kinda cake-like. Does the pumpkin help it come out softer? These are lighter and less cakey even though they are made with cake mix. I think between the pumpkin and milk, the batter isn’t as dense. Definitely not crueller like but lighter than other cake donuts.